Soundtracks have always been one of the main pillars in video games. This has, of course, evolved throughout the years in many forms, leaving different marks in each experience. In some, when either the story or the gameplay falls short, we often tend to remember a moment or a scene thanks to a song. Others experiment with a constant mix, blending both realities like it happened with NieR: Automata’s hacking system (which has been thoroughly explained by the game’s composer). But, what I find truly special is when a musical score creates an identity for a game. Dandara, a recently launched metroidvania by brazilian game studio Long Hat House, illustrates this idea to perfection. The developers, João Brant and Lucas Mattos, took inspiration from Dandara dos Palmares, a Brazilian warrior who fought against slavery during the colonial invasions in the mid 1600s. 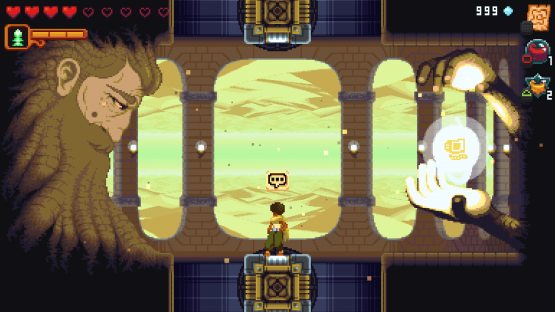 The fictional character of Dandara recalls to these roots, fighting her way through a massive oppression that has arrived into Salt, a multi-directional world without gravity in which the game takes place in. Mixing exploration with a similar progression system best known from the Souls series, a detailed pixel art style, and an unique way of movement by replacing the traditional controls for only a jump, Dandara just needed a spine that connected it all. That spine wound up being the soundtrack. In the beginning, the devs didn’t give Thommaz Kauffmann, the composer behind Dandara‘s 20 original songs, any musical inspirations to work upon. Thanks to this freedom, he was able to add his own impression to the game. Early discussions were just about what Lucas and João were getting inspired from. Concepts and emotions behind music albums they liked, life situations they wanted to express in-game. “I started doing some mood tests to find the right tone of the soundtrack, exploring and creating around instruments,” said Kauffmann. “When I felt that I was done with that, I started to write the main theme, which I planned to be the “seed” (or motif) of the whole game.” He was in pursuit of a way to add narrative to a non-story driven game by using the soundtrack. One of the challenges that Kauffmann faced was having to work on music while levels were still being developed. This meant that he had to inspire himself by looking at other aspects such as narrative, the emotions in that specific area, and what Lucas and João were thinking. However, sometimes the developers would listen to the music first, and then use it as inspiration for aesthetics, enemy design, or even the pace of a level. It all became a collaborative process that saw everyone inspiring each other. What really impressed me the most about Dandara‘s sound design was a particular song that teased itself in the latest trailers, showcasing its shortest version. The song, called “Weight of a Doubt” is present in each one of the boss fights. It never evolves into something greater, but after listening to it many times, I sensed the character in a struggle to fight against this chaos and oppression. At last, she manages to get involved in the song, gaining more and more leadership. Giving an even closer look into this, Thommaz stated that while this depends on others factors such as colors, animation, gameplay, and writing, this line of thought helped him build a better coherence for the soundtrack and gave me insight to look in the compositional side. For “Weight of a Doubt” he tried to condense all the conflicts in the game’s universe, before and after Dandara exists. Every time Salt had a doubt about itself, it’s a path to drastic changes and the cause of the whole game. Diego Argüello is a freelance writer based in Argentina. His work can be found in Unwinnable, Quillstreak, and other outlets. Follow him on Twitter.